This week we started in a local homeschool co-op. 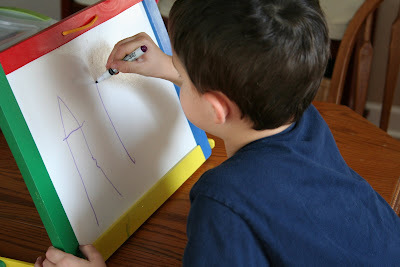 Zachary's class is focusing on a letter of the alphabet each week, so we started working on letter "Aa" activities. Zachary also started trying to putting his own words together this week. 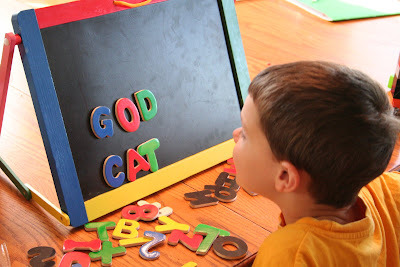 He kept asking for me to sound out a word and he would use our magnet letters to "write" them on the board: hut, God, cat...he loved it and was so proud of himself for doing it! He even sat down and started reading some simple words to me!! Yeah, Zachary! He's also making big improvements in cutting and making most of the letters in his name - that "Z" can be awfully tricky! 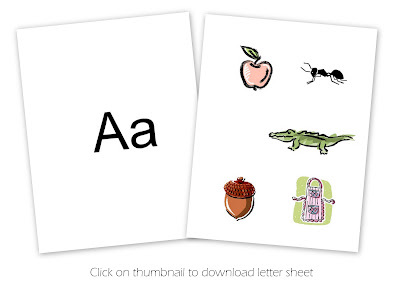 The alphabet book page for the letter "A" was an apple this week. 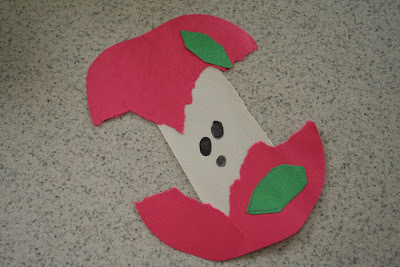 I cut out an apple shape from red construction paper and Zachary ripped it in half horizontally so that it looked like the apple was munched on a little bit. He also tore the sides of a white rectangle cut out from construction paper and we glued the top and the bottom of the apple to it. He added a leaf and made seeds for the core of the apple by making black fingerprints. Too cute! Ink pads are always a favorite and since they were already out this week, Zachary went ahead and made little ants using his fingerprints. When he was done making the bodies with his fingerprints, he added legs and antennaes on them. Apple Prints – cut an apple in half and use it to stamp colorful prints on paper. We have a white board and chalk board all-in-one from Melissa and Doug that Zachary likes to use, so this week he practiced his letters on the white board (because using the eraser is much fun! I do believe that this is a must-do. I admit that I'm not a home school mommy, but even if you aren't a formal home school mommy, you are still a home school mommy! This is the perfect activity to start with my son. I found your blog through searching alphabet activites for preschool. My son just turned 3 in June and I think he'll get a kick out of this. I was wondering if you had any posts about the co-op that you are invoved in? I'm just curious about what it consists of, how it got started and how it functions. I'd love to start something like that in my community but need some information! If you could point me in the right direction, I'd appreciate it! Thanks!